If you are serious about rugby, you need to be serious about recovery too. Playing and training for rugby takes an enormous amount out of your body, and you can only play and train at your best if you put everything you’ve lost back in as soon as possible. The demands of rugby are very specific, and there are very few sports that share those demands. You need to be fit, strong, fast, powerful, and agile, and training for all these things at the same time is draining. Training like this demonstrates just how important recovery really is. Then there is the rugby itself – it’s tough, bruising, and it’s very normal to play when injured – or at least somewhat knocked around from your last match or full-contract practice. Things have moved on a bit since the days of Roman gladiators and Vikings – thankfully – and now science has stepped in to provide cutting edge supplements designed to enhance performance and recovery. Once of the most well-known and commonly used supplements is creatine. Creatine is one of the most researched sports supplements around and has been in use for 20-plus years. In sports supplement years, which are a bit like dog years, this is a very long time indeed. Supplements that don’t work come and go in a flash, but the longevity of creatine means that, yes, it really does work. Creatine is a naturally occurring substance commonly found in muscle tissue. If you eat red meat, you can obtain creatine because you are consuming animal muscle. It plays a vital role in the production of adenosine triphosphate, ATP for short. This is your body’s primary source of chemical energy. The more ATP you have, the longer and harder you’ll be able to train or play and the quicker you’ll recover. In most instances, these creatine variations are more expensive but no more effective than regular creatine monohydrate, so if you are going to use creatine, it makes sense to use the most researched, most cost-effective type – and that’s creatine monohydrate. Recovery – let’s get serious! Creatine is undeniably awesome for anyone involved in explosive anaerobic sports but, as a standalone recovery supplement, it’s not perfect. 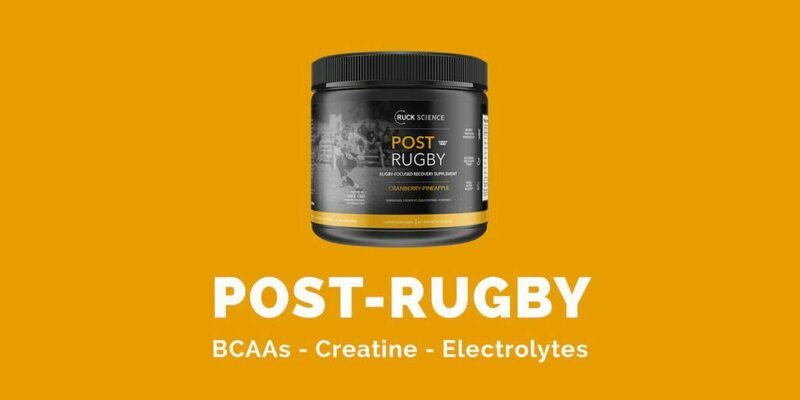 That’s why, at Ruck Science, we’ve taken creatine monohydrate and combined it with several additional ingredients to develop what we believe is the most effective post-exercise recovery supplement around. We’ve called it Post-Rugby and it’s available now! You might be thinking about pimping your current creatine supplement with some of these ingredients and making your very own recovery formula. Of course, you are free to do exactly that. But, if you do, be prepared to spend a whole lot of money in the process! Also, it’s worth considering that we have spent ages working out the ideal ratios between ingredients to create the most effective product. When it comes to designing supplement blends, part of the skill is in working out how each element will work with the others and, by combining them in very specific quantities, it is possible to create a synergistic effect where, literally, two plus two equals ten! With that out of the way, let’s look at what each one of those ingredients will do for you. L-Glutamine is an amino acid heavily involved in protein synthesis which means it enhances muscle repair and recovery. Also, Glutamine has been revealed as a very effective intestinal and immune system booster. (2) Hard exercise can cause short-term immune system suppression which can lead you open to marauding illness. L-Glutamine, by strengthening your immune system, can help ward off nagging illness. L-Arginine is another amino acid which your body converts into nitric oxide – a well-known vasodilator. This means it opens your blood vessels and enhances blood flow. The more oxygenated blood you can get to your hard-working muscles, the more quickly they will recover after exercise. L-Arginine is also linked to increased production of growth hormone, a powerful anabolic substance that enhances muscle growth and recovery. (3) L-Arginine is so good that it’s the central focus of our nitric oxide booster NOxide. It comes with Post-Rugby in Ruck Recovery (Pro). Our electrolyte blend includes Trisodium Citrate Dihydrate, Potassium Chloride, and Sodium Chloride designed to maximize fluid replacement and restore the most commonly lost minerals. Black Pepper Extract is used in Ayurvedic medicine and has many healthful properties. It’s active ingredient, piperine, is linked to reduced inflammation, and the treatment of colic, anemia, heart trouble and diabetes. However, it’s main strength is as an enhancer of nutrient absorption. (9) Piperine has been shown to inhibit the enzymes that would otherwise attack and destroy other molecules. By including black pepper extract, more of the supplements you consume will make it to their proper destination. Serious rugby requires a serious recovery supplement. Don’t undermine your efforts – use our new creatine-based recovery supplement to gain and edge over the opposition and get the most out of each and every workout. On game day, you’ll really notice the difference. Does rugby training matter without sleep?